General Learning Methods focus on the context of learning, instead of the person learning. These can range from reading and highlighting, to taking notes and making flash cards. But be warned, not all General Learning Methods are created equal. A recent study focused on the effectiveness of 10 commonly used and easy to apply study methods Dunlosky, 2013. A glance at the study’s results. Practise testing and distributed practice were seen as the most effective. They benefit learners of different ages and abilities, have been shown to boost performance across many types tasks and have a stack of evidence to support their practise. Testing is commonly remembered as nerve wracking end of year exams. However, extensive literature demonstrates the benefits of testing – not just of learning, but for learning.Notably, it’s not necessary for testing be to in that ‘high pressure’ end of year exam format. All testing, including ‘low pressure’ practice testing seems to result in benefits. Research has found that though multiple choice testing is effective, practice tests that require more detailed answers to be more effective, and practice testing remains effective when you create the questions yourself. Extensive literature demonstrates the benefits of testing – not just of learning, but for learning. The benefits of the ‘testing effect’ can not be overstated. Retrieval practice works for learning concepts as well as for learning facts. It improves memory and reduces forgetfulness, it does so in a durable and flexible way. And even when you’re wrong on the tests, retrieval practise can help you learn, and can also give you a healthy reality check against our expectations, whether they be over or under confident. Distributed practice refers to a particular schedule of learning sessions, as opposed to a particular kind of learning session. That is, the distributed-practice effect refers to better learning when learning sessions are spread out in time than when they occur in close together, but those learning sessions could involve reading textbooks, reviewing notes, or even taking practise tests. One of the most important questions about distributed practice involves how to space the learning episodes—that is, how should the learning schedule be arranged? In brief, criterion performance was best when the time between sessions was approximately 10–20% of the length of time you wanted to remember something for. Elaborative interrogation, self-explanation, and interleaved practice are moderately effective, the benefits of these techniques generalise quite well across learners and some contexts. Their weaknesses however is that we just don’t know enough about them yet: elaborative interrogation and self-explanation have not been adequately evaluated in educational contexts, and the benefits of interleaving have just begun to be systematically explored, so the ultimate effectiveness of these techniques is currently unknown. That being said, what exactly are they and how can we get the best use of them? This method works for children from as young as 10 years old, and seems effective across a wide range of topics. The dominant concept behind this is that enhances learning by supporting the integration of new information with your existing prior knowledge, but the associated drawback is that the benefits of elaborative interrogation may be limited for learners with low levels of the fundamentals of the subject learnt. Self-explanation involved the learner explaining and recording how one solves or understands problems as they work and giving reasons for choices that are made. Self explanation has been found to be effective with learners ranging from children in kindergarten to older students working on algebraic formulas and geometric theorems. However an issue with this method is that compared to other learning methods it can be relatively time consuming. When creating a learning schedule, most students create blocks of study, such that all content from one subtopic is studied before the student moves on to the next set of material. In contrast, recent research has begun to explore interleaved practice, where students alternate their practice of different topics or subjects. The research that has so far been conducted seems to suggest that interleaving can be very useful for cognitive tasks such as maths problems. However, there is a significant lack of evidence to go on for the notion of interleaved-practise for most other subjects. 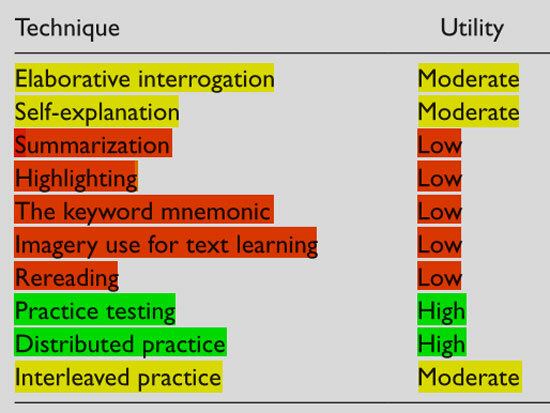 These five techniques received a low utility assessment: summarisation, highlighting, the keyword mnemonic, imagery use for text learning, and rereading. They were generally rated as being less effective than the methods described above or very limited in their application. Summarising texts has been shown to help some students on some tasks, yet in order to be helpful students need to be quite skilled at summarising, something most of us (graduates included) are not, and much research is still needed to fully explore their overall effectiveness. Likewise imagery can improve students’ learning of text materials, but the benefits are largely constrained to imagery-friendly materials. The keyword mnemonic method is very limited, showing only mild benefits which are limited to keyword-friendly materials, and it may not even produce durable learning. Highlighting also does little to boost performance in the majority of contexts. It may help when texts are difficult, but it can actually reduce performance on higher-level analysis tasks. Although rereading can be applied to a variety of contexts, is relatively economical with respect to time demands and training requirements when compared with some other learning techniques, rereading is also significantly much less effective. This study has hopefully helped some to elucidate the issues with popular general learning methods and brought a new light to lesser known ones. Of course, this isn’t the end of the story though. Next, we’ll take a deeper look at what makes a learning method successful, and how we can apply these techniques to our own studies.